Thank you for your business and support. 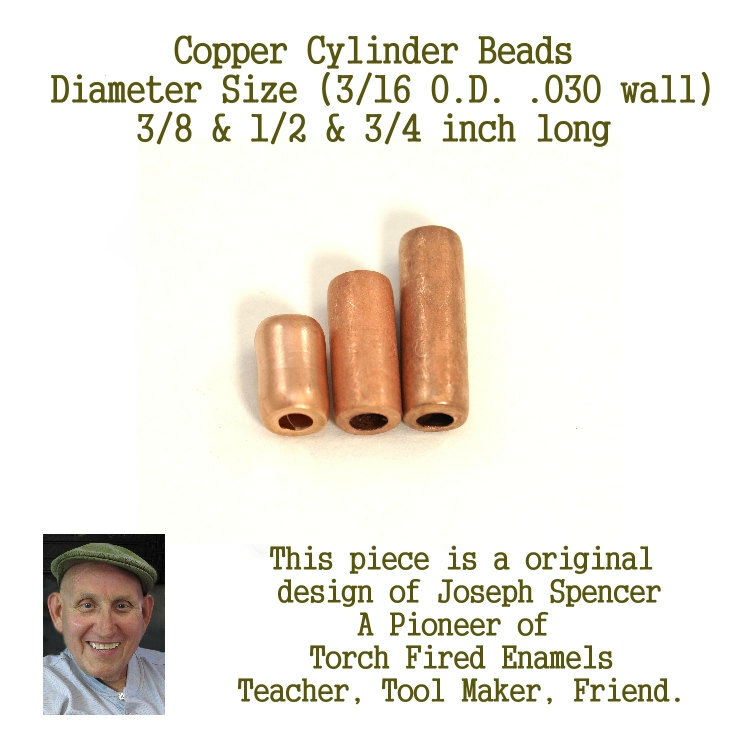 Copper Cylinder Beads for metalsmiths, enamel artists and designers (mixed package) hand cut Hand made beads by Joe Spencer & Jim Swallow ** this is our large hole bead ** YOU ARE GOING TO RECEIVE 4 BEADS OF 3 DIFFERENT SIZES.... Hand Made: Joe Spencer & Jim Swallow Material: Copper Thickness: .25 or 1/4 inch Wall Size: .030 Length of bead: 3/8 inch long & 1/2 inch long & 3/4 inch long Shape: Cylinder or Tube Bead Size: considered to be a large holed bead. Nice to use with wire wrapping and designing. 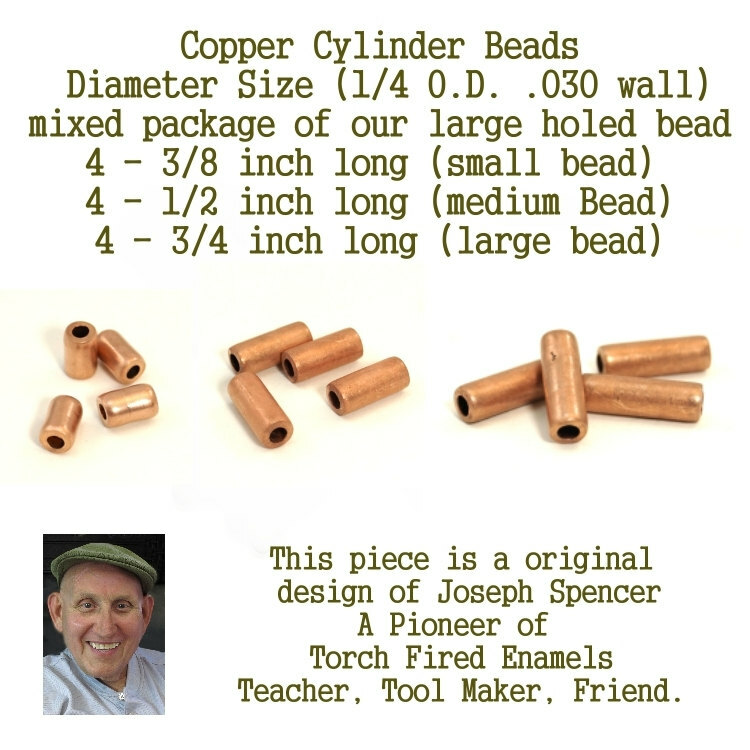 * If you will be torch firing this bead, use your medium to large Mandrel Please note we make by hand all the cylinder or tube beads. It takes time and patience to cut, sand, file and clean out each hole. We do the very best we can to make each bead as nice as we can. Sizes may vary, and if so it will be very little, we try our best to keep the bead sizes consistent. But again, keep in mind, these beads are being hand cut and prepared. 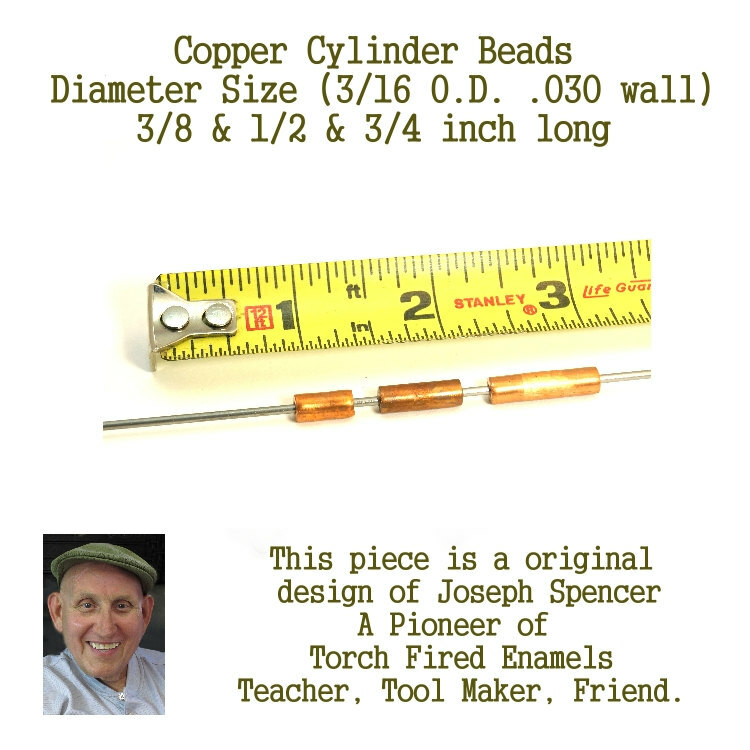 If you've been blessed enough to have taken torch fire copper enamel bead lessons with Joe Spencer, these are the size beads he has used for all his torch fire enamel classes since 1970. All our items come from a smoke free, perfume free, pet free environment. If you have questions or need larger quantities of our beads. please email us or contact us by phone 727-596-7822 We are Eastern Standard Time. Thank you, we look forward to serving you. Copyright I Love Enamels.com. All Rights Reserved. by 3DCart eCommerce Website design.